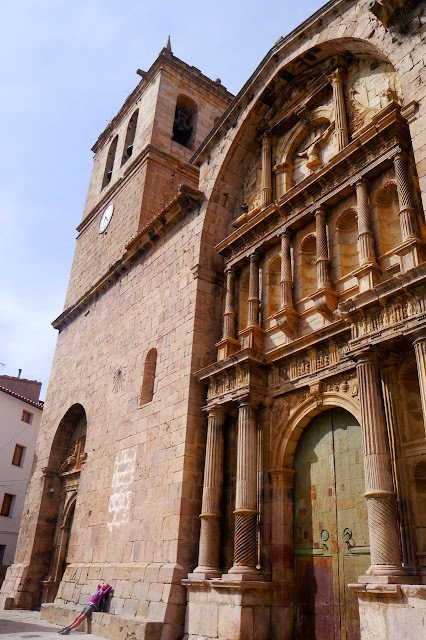 Walking through Castellón is getting better and better. Day 5 was wonderful and it’s hard to see how it can be topped. The weather was perfect, it was a tough, challenging walk, and the scenery was absolutely amazing. The only thing not to work was the discovery that the anticipated lunch stop, a restaurant in an ancient monastery, is only open at the weekend. Even this wasn’t a disaster, however, because after a rushed last hour we managed to get to Vistabella del Maestrazgo before they stopped serving lunch. The drama of being the last people to arrive (3-30!) only added to the sense of achievement. Compared to Day 4 (and Day 3), the walk to Vistabella del Maestrazgo is a stroll. It’s just over 20km long and even with 1000m of climb can comfortably be completed in less than 7hrs. 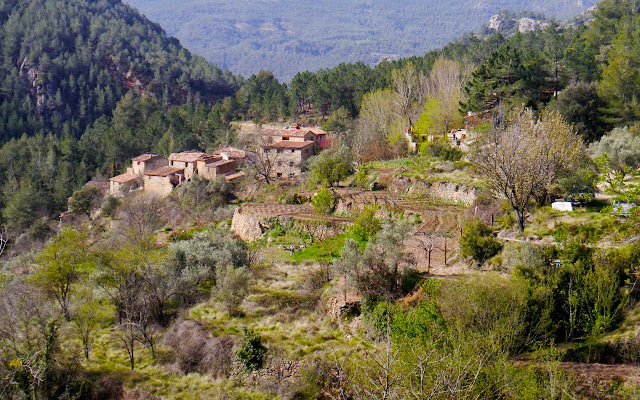 The restaurant in the little town is good, full of hikers and with a great atmosphere, but the walking was so nice that staying out longer and having a picnic would have made sense. It’s a straightforward route involving: an easy walk along the bottom of a valley next to a a stream; a steady climb up the side the valley with huge views along a dramatic, almost exposed path; and, once over the pass a traverse across a wide upland plain. 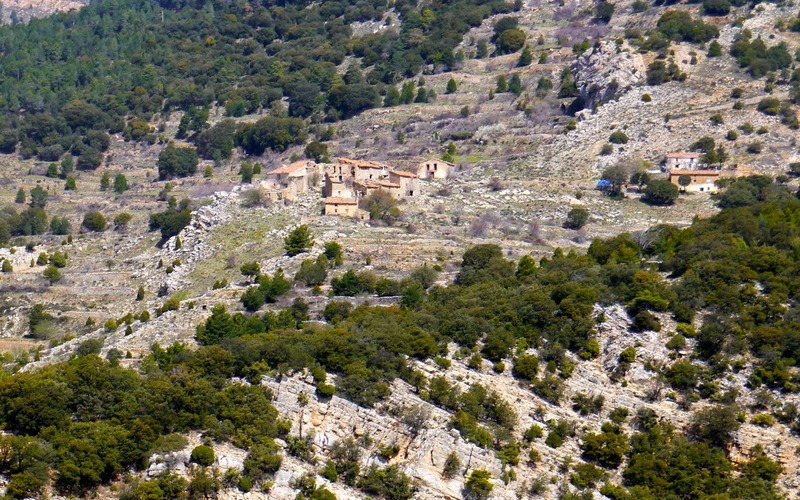 Vistabella del Maestrazgo set amongst ancient terraces, some of which are still used, is the highest occupied village in Valencia and, close to the iconic Penyagolosa, is an important destination for hikers. From the square in the centre of Villahermosa del Rio (which features a wonderful bakery), the route heads north and drops into a valley. The views back to the town are excellent. It then follows a noisy little stream, the Rio Carbo along the bottom of what is almost a gorge. After a kilometre, and a short climb, it visits the hamlet at Roncales. There is a casa rural here that welcomes hikers and that has a reputation for excellent food. 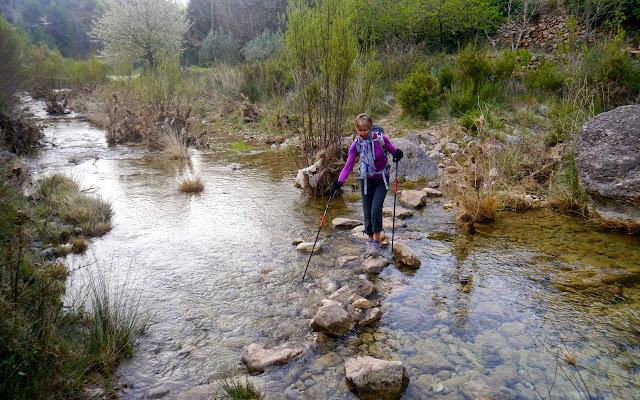 The route then returns to the river to continue its journey along the valley for another 3km. At an abandoned farmhouse, surrounded by beautiful trees, it crosses a bridge, heads east and starts a gentle climb. 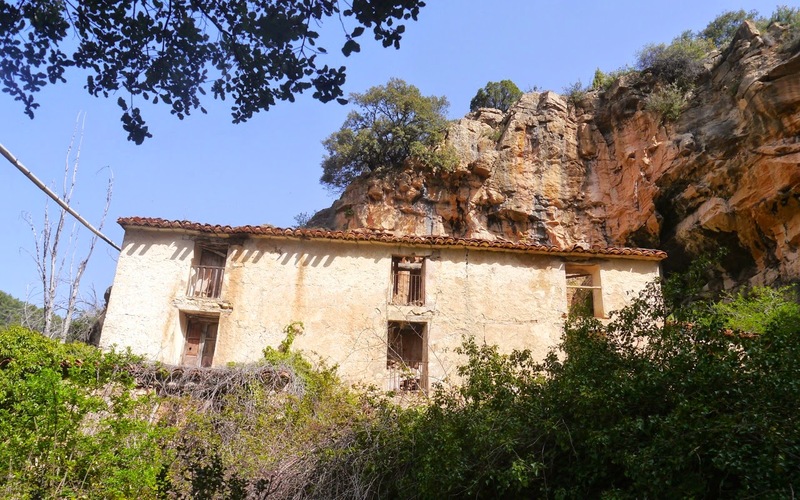 Very quickly the views open up and small abandoned settlements can be spotted everywhere perched high up the side of the valley or nestling near the river. 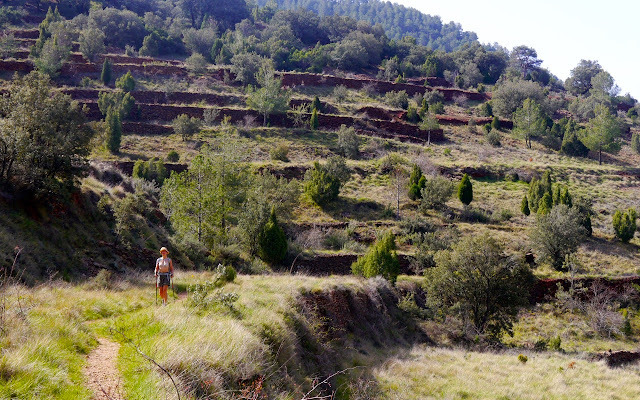 Each settlement is surrounded by a patch of terraces and it’s hard to imagine how the long gone occupants could have grown enough food to sustain themselves. 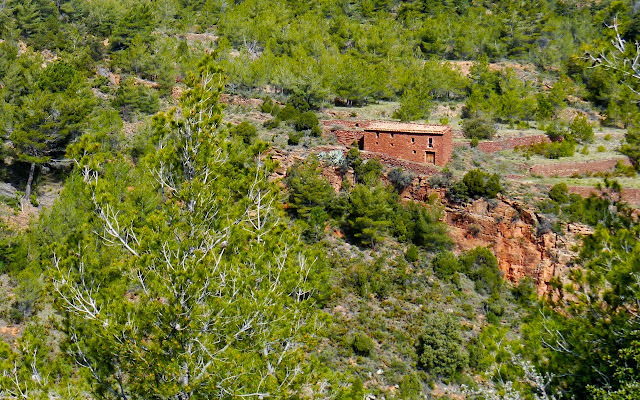 Particularly attractive is a red house built of stone from a narrow band of red rock that cuts across the valley. After visiting the rotting Masìa de Carbo, with its waterfall, the route starts a more serious climb up to the pass and the highest point on the GR7 in Castellón (1370m). Although perfectly safe, the path at times could be described as ‘exposed’ and the views are dramatic. 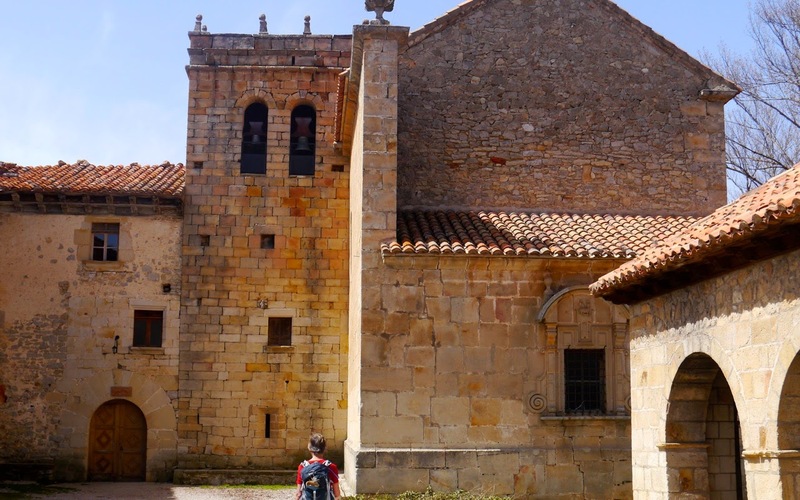 From the pass, it’s just under 2km to the Sanctuary Sant Joan de Penyagolosa an isolated group of medieval buildings the oldest of which date back to the 13th Century and the reconquest of the Valencia by Jaime 1 of Aragon. Although the shady central courtyard provides a haven from the sun access to the buildings, including its restaurant, are limited to weekends and bank holidays. From the Sanctuary the immediate waymarkings are confusing, but the path becomes better defined as you get away from the buildings (it stays close to the road for about 200m). After passing through a campsite the route follows a path through pine forest and out onto a flat cultivated plain, a surprising feature given the altitude (1200m). Scattered about are small, windowless stone domes, shelters dating back to a time when the plain, now growing barley, was used for grazing sheep. 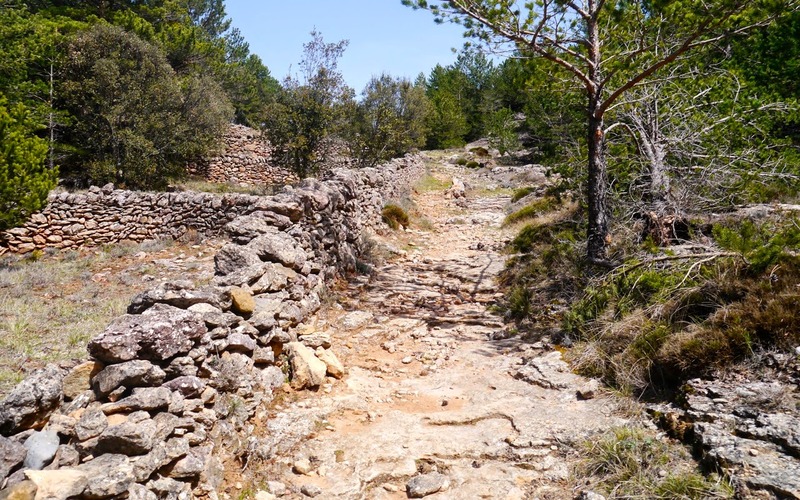 The final approach to Vistabella del Maestrazgo passes through some lovely old fashioned countryside with a lane lined out by dry stone walls. If you're not in rush for lunch, then take a slight detour and take the southern route into town and see it at its best. 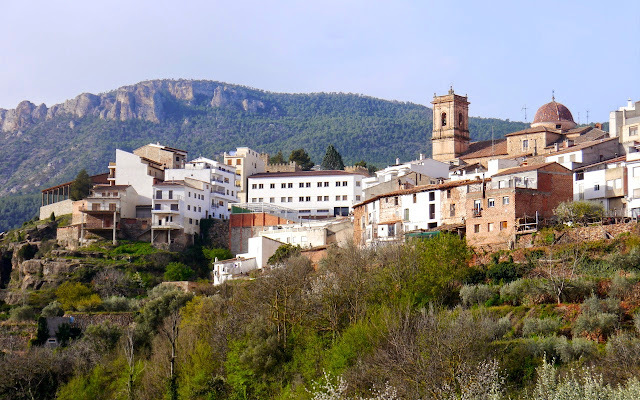 There are several casa rurals in the town, but I would definitely recommend A Un Pas del Cell whose host, Ramón is very knowledgeable about local walks.